Summer days are some of the best days of the year… but not always the best days for your clothing. Especially when the heat and humidity are at their peak. How do you keep those white shirts from yellowing around the collar or underarm areas? How do you get the stains out, especially if you’ve already laundered it a few times before noticing the discolouration? Not to worry, those stains and the odours that can come with them will be taken care of with your Speed Queen washer and these quick tips. 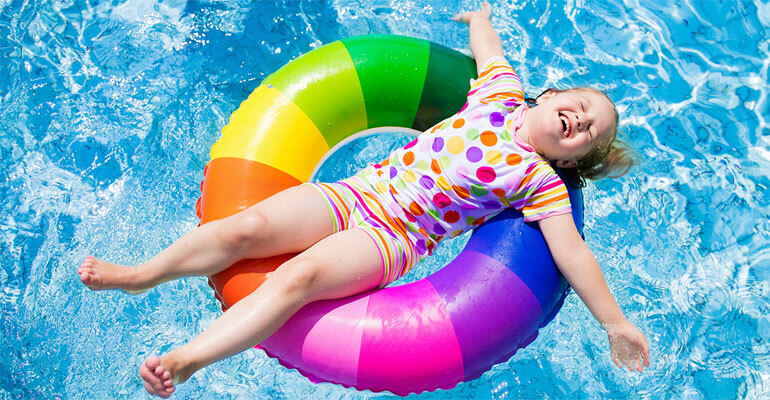 Chlorine, commonly found in pools to keep them free of harmful bacteria, is the sworn enemy of swimsuits. It causes colors to fade and eats away at the fabric, especially synthetics and polyester. And, since most women’s bathing suits contain spandex or Lycra®, chlorine can damage the elasticity as well. Other common causes of swimsuit damage include sunscreen, deodorant, perspiration, body oils — even the sun and sand. But washed the right way, your suits can keep their shape and hold their colorful hues so you look your poolside best all summer long. It’s easy to take good care of swimwear, but there are a few tricks to doing it right. For best results, women’s bathing suits typically should be washed by hand. The most important step is rinsing swimwear immediately after wearing, then washing it as soon as you get home. 1. Fill a sink or tub with cool water. 2. Add mild hand soap, not laundry detergent, to prevent fading. 3. Soak the swimwear for 15 minutes, then gently massage it to work out any dirt and chemicals. 4. Drain the soapy water and rinse the swimsuit until the water runs clear. 5. Roll — don’t wring — your bathing suit on a towel to remove extra water. 6. Lay flat to dry. Don’t hang it as the water pooling in the fabric can cause permanent stretching. 1. Put the bathing suit in a mesh laundry bag to prevent straps from getting caught. 2. Use a mild, bleach-free detergent. 3. Wash in cold water on the gentle or delicate cycle along with a couple towels or delicates to prevent over-agitation. 4. When the wash has finished, tightly roll all the water out and lay flat to dry. Men’s swimwear does not have the same elastics that women’s do, so they can typically be washed in the washing machine. 1. Check the label to make sure it’s machine-washable. If it’s not, wash it by hand. 2. Wash in cold water on the gentle cycle using a bleach-free detergent. 3. When the wash cycle is complete, tightly roll the swim trunks to remove any excess water, then lay flat to dry. The best defense against sunscreen stains is to let your skin absorb the sunscreen before you put on your swimsuit. However, if you do get a sunscreen stain, baking soda or vinegar may be able to get it out. 1. Baking soda method: Sprinkle a generous amount of baking soda on the stain, let sit one or two hours, then wash.
2. Vinegar method: Soak the stain in a solution of one part vinegar and three parts water. You can also apply white vinegar directly to the stain. Wash.
By following these simple steps, you’ll keep your swimwear beach-ready all summer long. Have fun in the sun!